The Pharaoh Khufu and his descendants, Khafre and Menkaure, have commissioned three pyramids to be built. 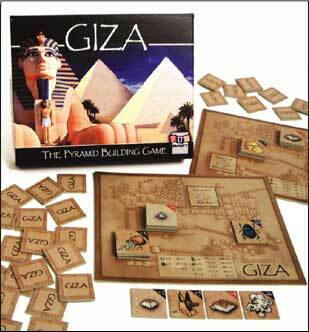 As an Egyptian pyramid builder in ancient Giza, you will try to construct the finest three pyramids using good quality stones and to fill the pyramids with as much treasure as possible. Your rivals may try to thwart you by sabotaging your pyramid with inferior stones, by demolishing your constructed levels or by releasing scarabs at your construction sites to scare away your workers. Perhaps you may need to do the same to your rivals so that your three pyramids will be the finest ones chosen by the Pharaohs for their after-life!